WASHINGTON (July 22, 2014) – Existing-home sales increased in June and reached an annual pace of 5 million sales for the first time since October 2013, while rising inventory continues to push overall supply towards a more balanced market, according to the National Association of Realtors®. Total existing-home sales1, which are completed transactions that include single-family homes, townhomes, condominiums and co-ops, climbed 2.6 percent to a seasonally adjusted annual rate of 5.04 million in June from an upwardly-revised 4.91 million in May. Sales are at the highest pace since October 2013 (5.13 million), but remain 2.3 percent below the 5.16 million-unit level a year ago. Total housing inventory2 at the end of June rose 2.2 percent to 2.30 million existing homes available for sale, which represents a 5.5-month supply at the current sales pace, unchanged from May. Unsold inventory is 6.5 percent higher than a year ago, when there were 2.16 million existing homes available for sale. The median existing-home price3 for all housing types in June was $223,300, which is 4.3 percent above June 2013. This marks the 28th consecutive month of year-over-year price gains. Distressed homes4 – foreclosures and short sales – accounted for 11 percent of June sales, down from 15 percent in June 2013. Eight percent of June sales were foreclosures and 3 percent were short sales. Foreclosures sold for an average discount of 20 percent below market value in June, while short sales were discounted 11 percent. The percent share of first-time buyers continues to underperform historically, rising slightly to 28 percent in June (27 percent in May), but remain at an overall average of 28 percent over the past year. According to Freddie Mac, the national average commitment rate for a 30-year, conventional, fixed-rate mortgage dropped for the second consecutive month to 4.16 percent in June from 4.19 percent in May, and is the lowest since last June (4.07 percent). Properties sold faster for the sixth consecutive month in June; highlighting the fact that inventory is still lagging relative to demand. The median time on market for all homes was 44 days in June, down from 47 days in May; it was 37 days on market in June 2013. Short sales were on the market for a median of 120 days in June, while foreclosures sold in 54 days and non-distressed homes typically took 42 days. Forty-two percent of homes sold in June were on the market for less than a month. For the third consecutive month – as well as the average of the previous 12 months – all-cash sales in June were 32 percent of transactions, up from 31 percent in June 2013. Individual investors, who account for many cash sales, purchased 16 percent of homes in June, unchanged from May; they were 17 percent in June 2013. Sixty-nine percent of investors paid cash in June. Single-family home sales rose 2.5 percent to a seasonally adjusted annual rate of 4.43 million in June from 4.32 million in May, but remain 2.9 percent below the 4.56 million pace a year ago. The median existing single-family home price was $224,300 in June, up 4.5 percent from June 2013. Existing condominium and co-op sales increased 3.4 percent to a seasonally adjusted annual rate of 610,000 units in June from 590,000 in May, and are 1.7 percent above the 600,000 unit pace a year ago. The median existing condo price was $215,700 in June, which is 3.2 percent higher than a year ago. Regionally, existing-home sales in the Northeast rose 3.2 percent to an annual rate of 640,000 in June, but are 3.0 percent below a year ago. The median price in the Northeast was $269,800, slightly below (0.1 percent) June 2013. In the Midwest, existing-home sales jumped 6.2 percent to an annual rate of 1.20 million in June, but remain 2.4 percent below June 2013. The median price in the Midwest was $177,900, up 4.6 percent from a year ago. Existing-home sales in the South inched 0.5 percent higher to an annual level of 2.06 million in June, and are up 1.0 percent from June 2013. The median price in the South was $192,600, up 3.4 percent from a year ago. Existing-home sales in the West rose 2.7 percent to an annual rate of 1.14 million in June, but remain 7.3 percent below a year ago. The median price in the West was $301,000, which is 7.2 percent above June 2013. The Pending Home Sales Index for June will be released July 28, and existing-home sales for July is scheduled for August 21; release times are 10:00 a.m. EDT. WASHINGTON (July 23, 2014) – Congressional action and the timely implementation of the Homeowner Flood Insurance Affordability Act relieved property owners of costly premium hikes and stabilized housing markets where flood insurance is required for a mortgage, said the National Association of Realtors® today in testimony before the U.S. Senate Appropriations Subcommittee on Homeland Security. There are additional steps that need to be taken, however, to fully address remaining issues. Within a month of the legislation’s implementation, FEMA issued rate-relief guidelines to insurers so that homebuyers would not have to pay more than current owners would at the time of their next flood insurance policy renewal. The relief also applies to current homeowners who bought a new policy or let one lapse, not just to owners who bought property after the Biggert-Waters Flood Insurance Reform Act went into effect last year. Within two months of implementation, FEMA announced its intention to hold 2013 rates constant through 2015 and in some cases even reduce rates. The agency has also provided guidance to insurers to issue refunds this fall to property owners who paid amounts in excess of 2013 rates. NAR looks forward to keeping the dialogue open and working with FEMA to build on the positive early efforts happening only four months after implementation of NFIP reforms. 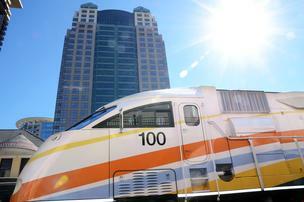 The Florida Department of Transportation has started the process of extending SunRail into Orlando International Airport. As of May 2014, 41.7 percent of single-family home transactions were cash sales, down slightly from 46 percent one year earlier. It’s the fourth year that cash sales were at 40 percent or higher, suggesting that investors continue to play a role in Florida’s housing market. Housing starts continue their ascent and will be more than double their 2013 levels by 2017. Total starts will be over 95,200 in 2014, just over 136,000 in 2015, 162,700 in 2016 and 166,200 in 2017. This growth in residential construction activity will catalyze growth in the commercial sector and “push employment growth in the construction sector into double-digits. WASHINGTON – July 23, 2014 – After a series of fits and starts, the national housing recovery is now enjoying a burst of activity from the military population. The withdrawal of U.S. troops from overseas war zones means that a large number of enlisted persons are coming home and ready to buy homes. Hazard pay, combined with tax-free housing and food allowances, has positioned many to amass a sizable downpayment; and even those who cannot afford to put a large amount down can benefit from one of the easiest and least expensive financing options available: Veterans Affairs mortgages. “VA buyers are coming into the market in higher and higher proportions and tend to be first-time buyers, one of the missing drivers in the recovery in housing demand,” notes CoreLogic deputy chief economist Sam Khater. VA financing for purchase loans jumped 19 percent to 241,190 loans in fiscal 2013, the most since at least 2000. And for the first three months of this year, they made up 8.1 percent – $19.5 billion – of mortgage activity, up from 6.9 percent in the same quarter of last year. Besides the return of deployed soldiers, the VA loan program is gaining market share because of its newfound popularity in light of FHA changes that have made its products more costly for borrowers. TALLAHASSEE, Fla. – July 23, 2014 – An extra charge on property-insurance and auto-insurance policies to cover claims paid for the 2004 and 2005 hurricane seasons will end Jan. 1. The Office of Insurance Regulation formally issued orders Tuesday for insurance companies to move up by 18 months the end of a 1.3 percent “emergency assessment” for the state-run Florida Hurricane Catastrophe Fund, which provides backup coverage to insurers. The assessment has hit policyholders for $2.9 billion, which has gone to reimburse insurance companies for claims from the eight hurricanes that hit Florida in 2004 and 2005, the last time a hurricane made landfall in Florida. Miller said the industry had been waiting for the orders so it could begin preparing for the new end date for the assessment, which previously had been set for July 1, 2016. The orders make official a decision Gov. Rick Scott and the Cabinet made last month to end the assessment, Amy Bogner, a spokeswoman for the Office of Insurance Regulation, said in an email. The assessment, which first appeared at 1 percent in 2007 and was raised to the current rate in 2011, collectively hits policyholders for between $350 million and $500 million a year. In addition to the state’s near-decade luck at avoiding hurricanes, the early termination is due to claims for Hurricane Wilma coming in $498 million less than what had initially been thought. Wilma hit South Florida in October 2005. Also, the fund received more money than expected due to an increase in policies statewide. The charge is imposed on most property and casualty policies other than medical malpractice and workers compensation. The catastrophe fund, better known as the Cat Fund, currently has about $13 billion on hand and is expected to be able to raise an additional $4 billion, which is considered solid ground for covering most post-storm claims. In addition to the Cat Fund assessment, the state-backed Citizens Property Insurance Corp. adds an extra 1 percent charge on most policies to cover losses from the 2005 storms. First imposed in 2007, the state expects that charge to be paid off in June 2017. Top 10 Beach Camping Spots in Florida! Wow! Here’s a great idea for the summer…combine camping with the beach! Click the link below to see the top 10 beach camping spots in Florida. So, what do you prefer…camping and the outdoors or the hotel experience? You are currently browsing the Imagination Realty blog archives for July, 2014.